The bright red cardinal is a beloved bird. It’s the mascot of several sports teams, the state bird of several states, and even makes an appearance in the Angry Birds movie! Cardinals are known for their brilliant color and beautiful songs, but there’s much more to learn about these scarlet songbirds. Let’s get started! 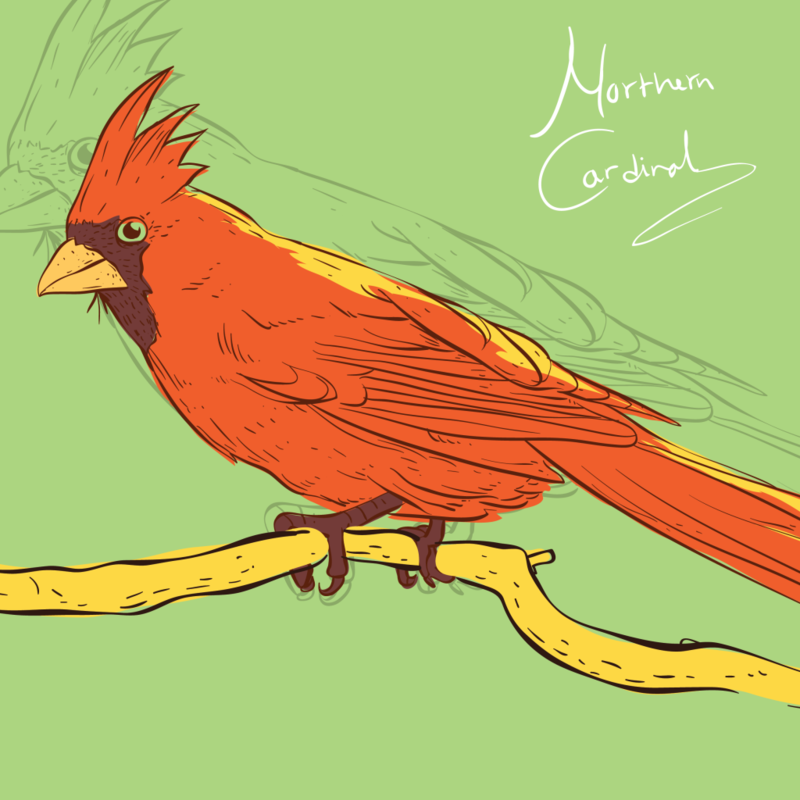 What do cardinals look like? The cardinal is a long-tailed songbird. Both males and females are about eight to nine inches long and weigh about 1.5 ounces. Their wingspan is typically 10 to 12 inches. Cardinals have a short, thick, red-orange bill and a crest (sometimes called a crown), which is a group of feathers on top of their heads. Both male and female cardinals have black faces around their bills. However, there is one major difference between male and female cardinals. Males are bright red and females are pale brown with reddish wings, tails, and crests. Cardinals are mostly found in the Southeastern United States. In recent years they have expanded as far north as Canada. There are few cardinals in the western United States, but some do live in the desert Southwest. They can also be found in parts of Mexico and Central America. Cardinals need dense bushes for nesting and may live in city parks, forest clearings, swamps, and other brushy habitats. 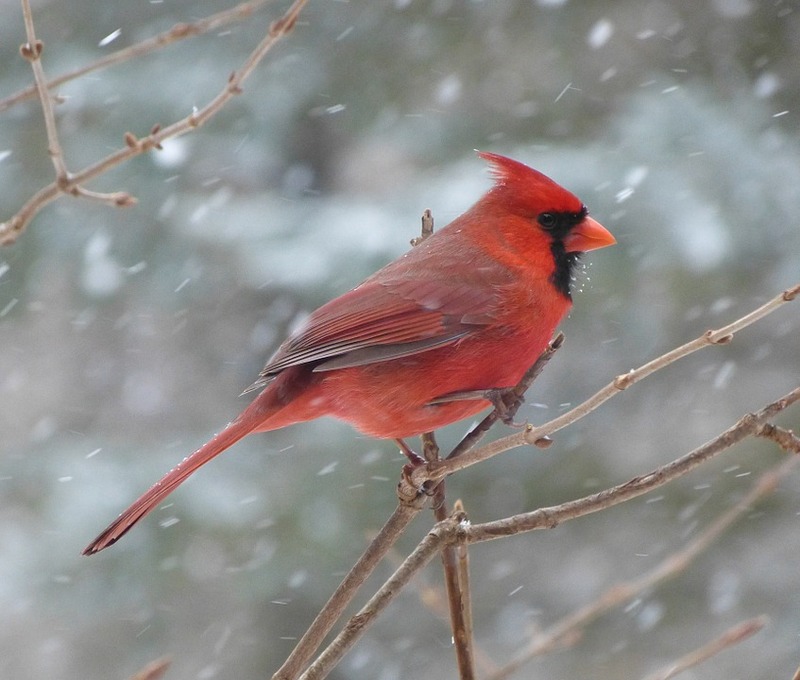 Unlike many other species of birds, cardinals do not migrate. Cardinals eat seeds, berries, and insects. This may include grasshoppers, caterpillars, beetles, ants, flies, spiders, snails, and others. Their diet is mostly made up of plant matter such as leaf buds, flowers, seeds of weeds and grasses, and many wild fruits and berries. Young cardinals are fed mostly insects by their parents. Unlike other songbirds, both male and female cardinals sing. Male cardinals sing to defend their nesting territory. They aggressively attack any intruders. The song of female cardinals appears to give males information about whether to bring food to the nest. Cardinals have many different songs and calls. 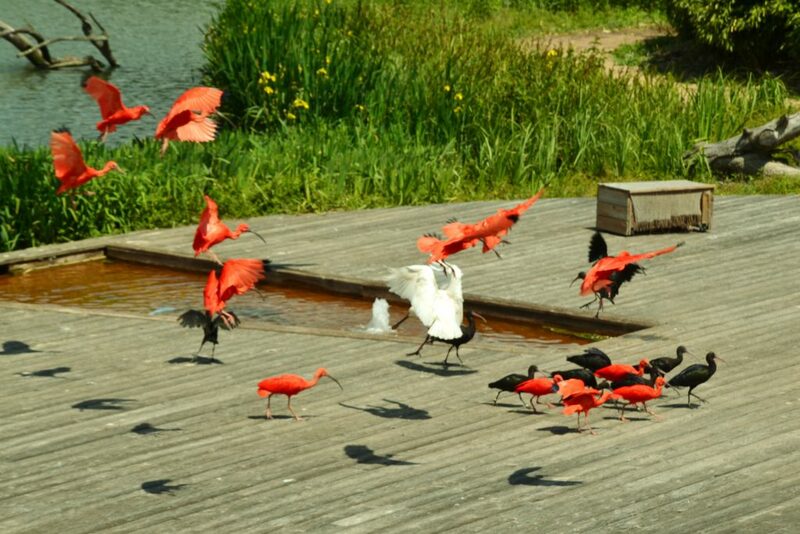 Cardinals are social and gather in flocks, sometimes even flocks that include birds of other species. However, they do pair off when it’s time to lay eggs. Once a male and female cardinal pair up, they stay together for life. While the female cardinal incubates the eggs (sits on them), the male cardinal feeds her. There are usually 3-4 eggs, although there are sometimes two or even five. After 12-13 days, the eggs hatch. Both parents help feed the young cardinals. The young cardinals can leave the nest about 9-11 days after hatching. Female cardinals lay eggs two or three times each year, sometimes four. The cardinal population is stable. There are an estimated 100 million cardinals in the world. Threats to the cardinal include predators like owls, foxes, hawks, opossums, cats, and cowbirds. Cowbirds are especially dangerous for young cardinals, and female cowbirds may remove cardinal eggs from the nest. Cardinals also face competition for nesting territory from birds like house wrens, crows, and English sparrows. Pesticides can be harmful to cardinals, and so can windows. 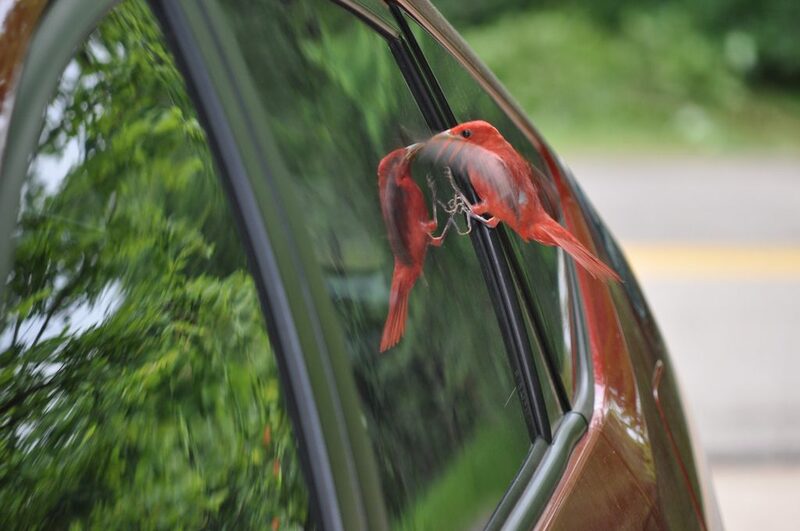 Aggressive male cardinals sometimes see their own reflection in a window and charge, thinking it’s a competing male. Overall, however, the cardinal population appears to be increasing. The species is unlikely to be endangered any time soon. The cardinal’s scientific name is Cardinalis cardinalis. Cardinals can live for up to 15 years, though most have shorter lifespans. Female cardinals build nests. The nests are open cups of twigs, grass, weeds, bark strips, and leaves. They are usually lined with hair or fine grass. 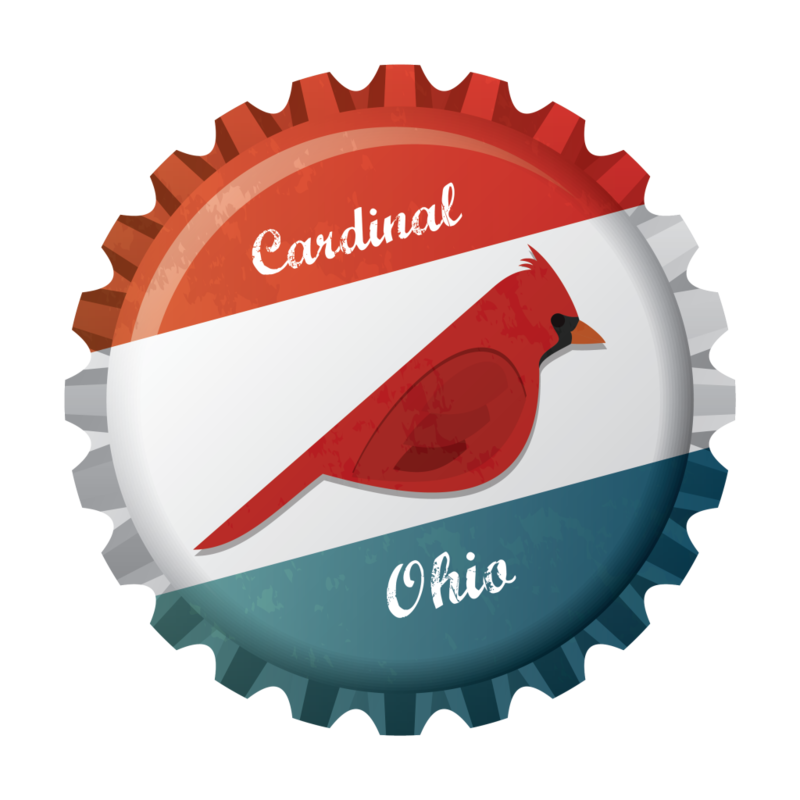 The cardinal is the most popular state bird in the United States. It is the state bird of seven states. Researchers have discovered local song dialects in cardinals. Neighbors share almost all of the same songs, but songs change increasingly with increased distance. A flock of cardinals is called a college, radiance, conclave, or Vatican.